emerging punk rock, new wave and alternative rock bands. The long list of eminent bands and musicians she has photographed includes, among others: U2, Aerosmith, Phish, The Police, The Cars, Duran Duran, The Buzzcocks, The Jam, Red Hot Chili Peppers, Joe Strummer, Billy Idol and Iggy Pop. BC looks back on her impressions of Duran Duran and of the photos she made with them. I was not a big fan of the whole New Romantics thing when it arrived from England in the eighties. When I listened to it for the first time, years later, I really liked it and was sorry I had dismissed them so readily. Dismissed them musically, I mean. As people they seemed very nice and accomodating. Not every band gave me records. I have long held regrets about missing the first US tour of Boy George due to a similar musical misjudgment. Posting this photo because whenever I look at it I have to admire the style efforts they made before they had the cash to be truly Romantic. Simon in deck sneaks and very early model cargo pants. A couple of them appear to be birdwatching in this photograph (sans binoculars). To see more of BC Kagan’s photography go to her Altpick page and blog. 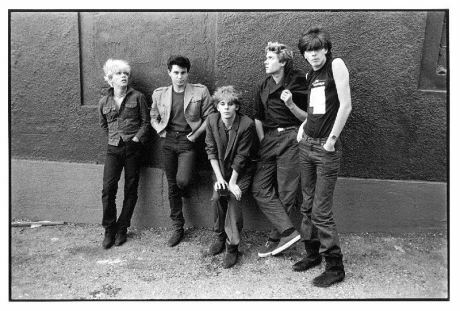 This entry was posted in Altpick, Photography and tagged 80s, BC Kagan, Duran Duran, New Romantics, punk rock. Bookmark the permalink.